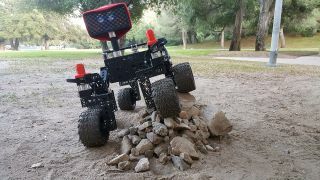 An Open Source Rover example, built by NASA's Jet Propulsion Laboratory: In this image, the rover shows off its ability to roll over a pile of rocks. Students and enthusiasts can now build their own Martian rovers, thanks to a new NASA project. Rovers like Curiosity and Opportunity have allowed scientists to learn about the Red Planet in an up-close and personal way. Now, builders of all backgrounds can learn the skills it takes to create these rovers using plans and instructions from the NASA Jet Propulsion Laboratory (JPL) Open Source Rover project, according to a statement published on Tuesday (July 31). NASA's Curiosity Mars rover captured this shot of the 2-inch-deep (5 centimeters) hole the rover drilled in a target called "Duluth" on May 20, 2018. This was the first rock sample captured by the drill since October 2016. This project is a successor to an earlier educational rover model called "ROV-E," which received positive responses in schools and museums, NASA said. The Open Source Rover offers a more affordable, less complicated model, and according to agency officials, people can assemble the new model with off-the-shelf parts for about $2,500. "While the OSR [Open Source Rover] instructions are quite detailed, they still allow the builder the option of making their own design choices," JPL officials said. "For example, builders can decide what controllers to use, weigh the trade-offs of adding USB cameras or solar panels and even attach science payloads. The baseline design of OSR … will allow users to choose how they want to customize and add to their rover, touching on multiple hardware and software principles along the way." JPL is home to the Mars Science Laboratory (which manages Curiosity) and is based in Pasadena, California.